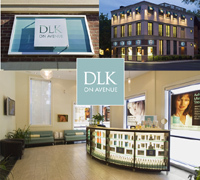 If your dermis is in need of professional care, go beyond typical spa services with a visit to DLK on Avenue, a state of the art medical clinic in fashionable Yorkville. Instead of being screened by an aesthetician, Harvard, trained cosmetic dermatologist Dr. Lisa Kellett evaluates your skins needs, using the most advances technology available. Novel non-surgical procedures for men and women include Ultrashape, a fat-reducing, body contouring treatment not available anywhere else in North America, and Intense Pulsed Light therapy with Levulan for acne prone skin. Rounding out the face-saving options is Kellett’s personally formulated cleansing line, the aptly named Kellett Skincare program.